The eclipse is Monday, but will clouds wreck the view? 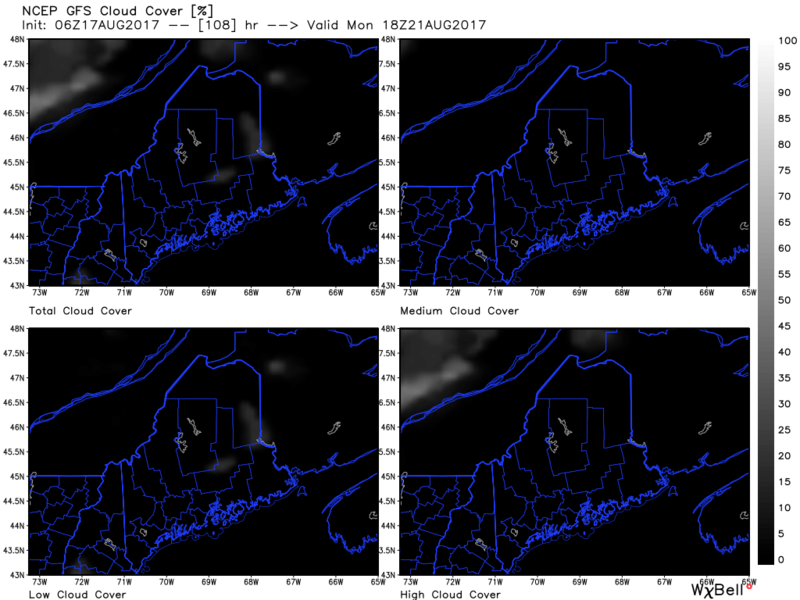 Clouds can ruin an eclipse party by preventing us from seeing the phenomena, but the weather is likely to cooperate Monday. The solar eclipse Monday has gotten a lot of attention. All of us, no matter where we are in the United States, will have a chance to see at least a partial solar eclipse. And in some areas, people will see the sun become completely covered by the moon’s shadow. In Greater Portland the eclipse will begin about 1:30 in the afternoon, peak about about 2:45 p.m. and end a few minutes before 4 p.m.
Don’t view the eclipse without ISO-approved glasses. A quick glimpse of the sun won’t do any more harm than any other time of the year when you briefly look up in the middle of the day and your eye briefly catches the sun. It’s staring at it that would likely cause permanent damage. Only one thing could go wrong. … That’s right: Clouds. Right now there are some areas of the country where they could be an issue. The image below, based on the GFS supercomputer model, shows some clouds in the western and central part of the United States, as well as parts of the Southeast, all near the path of totality. In the Northeast, high pressure is forecast to build into the region. The weather associated with high pressure is generally nice and often quite clear. 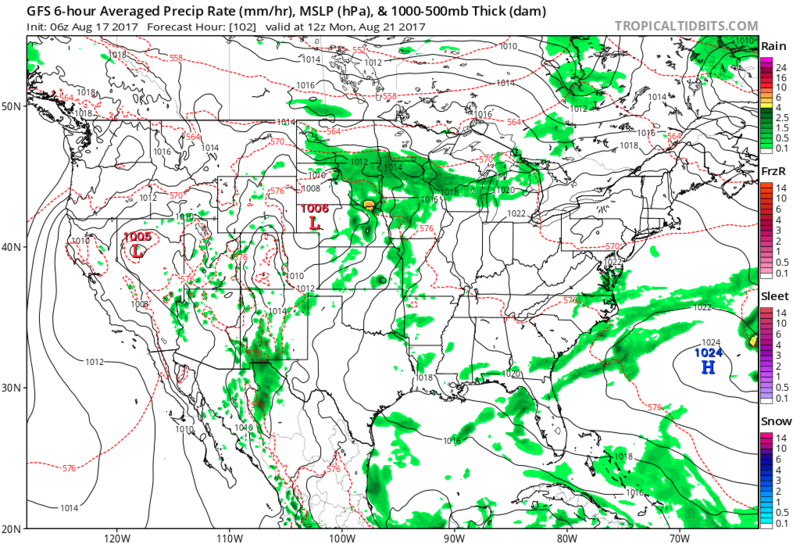 If the GFS model above is correct, the areas from Ohio to Maine and south to parts of Maryland should see generally clear skies. This would making viewing the eclipse easy and take the weather factor out of the equation. I took a closer look at other models which also show a forecast of high pressure over the Northeast. High pressure doesn’t always mean there will be no clouds, though. Sometimes, areas of high pressure do have them. I have been reviewing the three possible layers of clouds according to the models. We could see high, middle or low clouds. High clouds can dim the sun, but the eclipse would still be visible, while middle and low clouds would be more problematic. 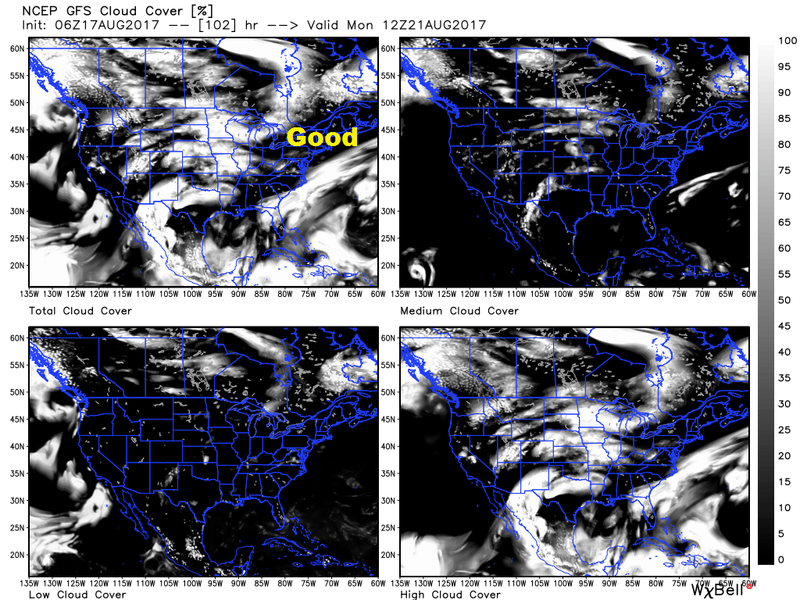 According to the GFS cloud forecast, all three layers should exhibit an absence of cloudiness. Again, this is great news for eclipse watchers – in that high-pressure area. The upper left image is a composite of the three layers. Since that quadrant is clear, it stands to reason the other three layers are forecast to be mainly clear as well. There are still a few days, of course, until the actual eclipse. However, multiple signs are pointing to a great period of weather for viewing this event in the Northeast. While this is certainly an event that doesn’t occur often, it’s not that rare. The next total eclipse for the United States is April 8, 2024, and the path of totality will go right over Mount Katahdin here in Maine. You can be sure the weather is more likely to be a problem that time of year than the middle of summer. You can follow Dave Epstein @growingwisdom on Twitter.